....a n d M o r e !! 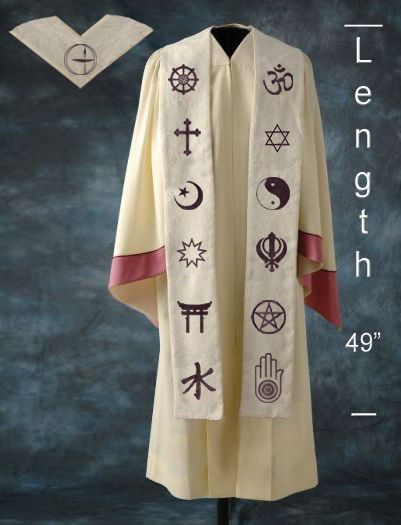 Make a dramatic statement with the Large Custom Interfaith Stole. It is our longest, measuring a generous 49" in vertical length (add 3 1/2" for fringe) by 5" wide. Choose as many as 13 symbols - 12 on the front and 1 at the top (apex) of the stole. The base price for this stole is $128. Add $7.00 for each symbol and let us know where you'd like them placed. Click here for our chart of available symbols. Can't decide on fabric colors? Click Here for our color chart. Place symbols according to this chart. For example, in the image, the symbol in Position 1 is the Dharma Wheel. In Position 7 is the Om. Leave the position blank if you do not want a symbol there. Incredible to work with, beautiful stoleAs a non-denominational minister I found it very hard to find a stole that represented my ministry. Fortunately, I was drawn to Oneness Interfaith. Working with them was a true pleasure, from receiving samples, to help with design questions. Everything was done in a most efficient and professional manner.